There is a flurry of duffel bags and sorting out boat tickets and hugs and kisses goodbyes to parents as each of us solemnly depart. We are practically stepping off into the abyss towards the great unknown, A.K.A. a white ferry on Puget Sound. There are tears; there are protests, yet exhausted parents still must shove their reluctant children aboard, a twinkle of guilt along with relief in their tired paternal eyes. I float among these hectic crowds; my dad is already gone. I’m yet to cry. Instead I am a speck of dust being herded like a sheep, backpack and Northface duffel in tow, my only company the novel Legend by Marie Lu. Guided aboard a packed vessel where I will feel incredibly alone. Looking back on it now, I was definitely being a little dramatic. As soon as I stepped upon that funny white boat, I was immediately invited into a game of cards with kids I had never met, yet I already felt oddly comfortable and welcomed among them. 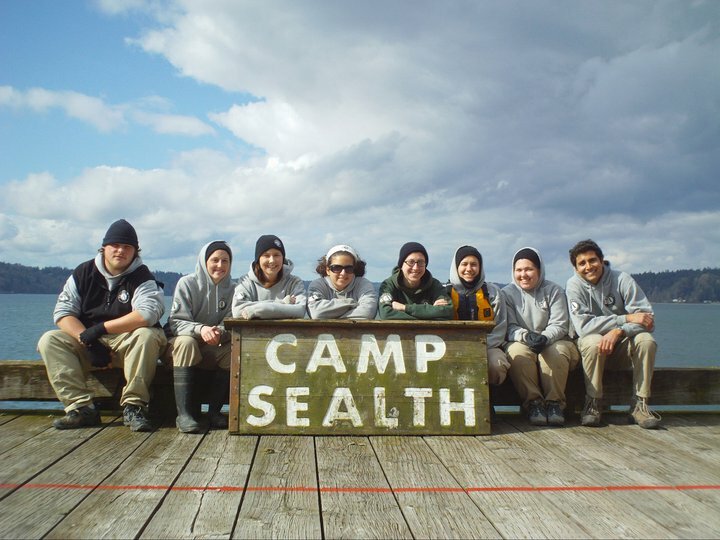 Some were regulars to Camp Sealth, and others were like me; it was their first time. And remember: I wasn’t even at camp yet. I was barely into the thick of the wonderful time ahead of me at camp, yet I already felt the love and sense of community there is at Camp Sealth aboard that boat. We docked a few hours later, were assigned our groups and cabins, and placed in the oldest group at camp. There were 6 of us total, co-ed, yet our seemingly unlikely grouping ended up bonding and becoming tighter knit than any of us ever would have expected. The days and hours we spent tangled up in each other’s lives between archery lessons, group hikes, crafts, kayaking, tie-dying, playing games, sleeping under the stars, and merely talking and getting to know each other created a friend group unlike any I had made before and I have made since then. Although my contact with all these people has been scarce in the years since then, they will all have a special place in my heart for as long as I live. So here’s the lesson here: if not for Camp Sealth, I wouldn’t have learned the importance there is in meeting new people. Before camp, surrounded by the same familiar faces at my school and neighborhood for years, I hadn’t truly bonded with anybody new in a long time. Although it was just summer camp, taking a leap and trying something new is always important for our growth and self-exploration. I learned skills I never would have learned back home in Seattle, like how to work a bow and arrow or how to make a fire (then again, you can learn this handy skill from the library with books such as How To Build a Fire). Camp Sealth set the foundation for an eagerness to try new things and step out of my comfort zone more often, and in the years I have ahead of me, hopefully I will do so to new levels besides just summer camp.